In loving memory of Emily Wilding Davison. In this broom cupboard Emily Wilding Davison hid herself, illegally, during the night of the 1911 census. She was a brave Suffragette campaigning for votes for women at a time when Parliament denied them that right. In this way she was able to record her address on the night of the census as being the House of Commons : thus making her claim to the same political rights as men. Emily Wilding Davison died in June 1913 from injuries sustained when she threw herself under the King's horse at the Derby to draw public attention to the injustice suffered by women. By such means was democracy won for the people of Britain. Notice place here by Tony Benn MP. See Davison's page for an explanation of this plaque. While still thinking about how to arrange a 'site visit' to capture this important memorial we were delighted, January 2017, to see this plaque while watching a recording of the BBC television series, Apple Tree Yard. 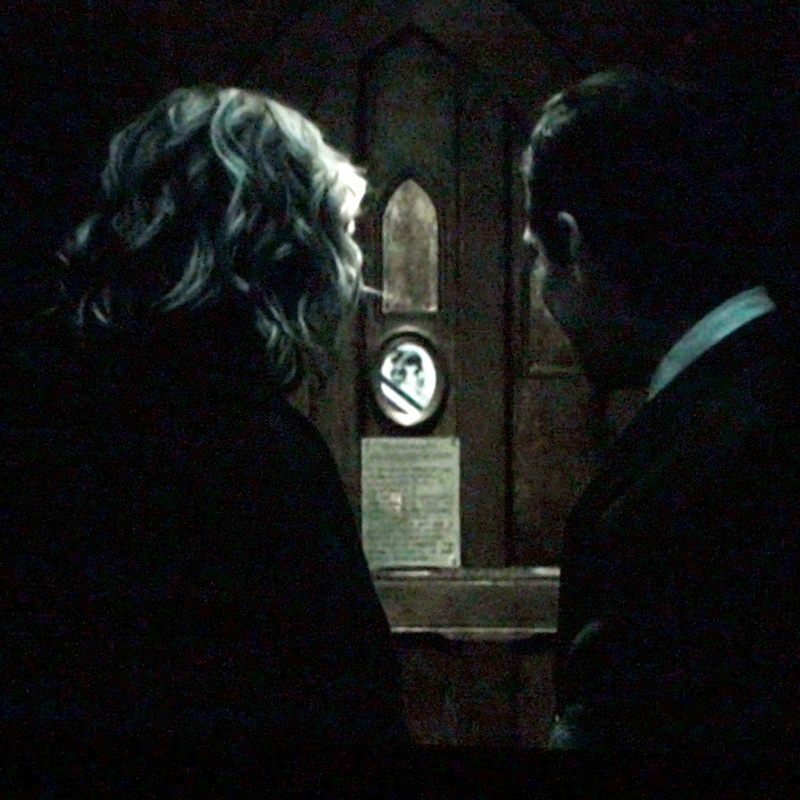 The handsome male character takes the attractive female character down to this cupboard to show her, not his etchings, but this plaque, and the inevitable happens. We rather lost interest in their activities at this point as we paused the image, rewound and took the best photo we could. Bad Reputation and Explore Parliament both have better photos - wonder how they got the site visit? The plaque is in the Chapel of St Mary Undercroft, fixed to the inside of a cupboard door. It is a large, nicely panelled cupboard, big enough to hold at least two people. Sadly our picture of the chapel, from the Telegraph, does not show the cupboard door. This plaque is not available for the public to see so we have had to try and work out its location from what we have read. The cupboard is either inside the Chapel or just outside its western end, at the bottom of a flight of steps which lead to Old Palace Yard. The Chapel runs east-west, at the southern end of Westminster Hall so its western end is indeed at Old Palace Yard. If at ground level it may be immediately behind one of the two doors that can be seen in the corner of the building behind the Richard I statue. But the level is uncertain. The chapel was originally the crypt of St Stephen's Chapel, which rather suggests a basement level but the reference to steps suggest it is at first floor. We need a site visit!